Stroll down the streets of Williamsburg, sail across the Atlantic Ocean, gallop along the Columbia River in the Pacific Northwest - all this and more will capture your students and engage them to learn more about our American history. Follow eight young girls on a journey through time. Watch as our country, government and culture change and how that affects life in the different time periods and how these girls discovered more about themselves and the world they live in. 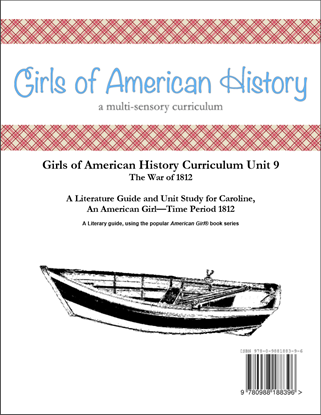 This curriculum uses the original eight historical girls from the American Girl® collection. Those girls are Kaya, Felicity, Josefina, Kirsten, Addy, Samantha, Kit and Molly. This is a multi-sensory curriculum, integrating hearing, seeing, writing, saying, doing. This is a curriculum for both boys and girls. Don’t let the “Girls” part of the title fool you. Crafts include; pottery, leather work, weaving, drawing, cooking and much more. Field trips and education vacation suggestions are also included. Includes eight units that are six weeks in length each. All units now include spelling and vocabulary, State/Country study, Character analysis worksheets, then and now comparison worksheet, news article prep, book summary, chapter summary with drawing, and digging deeper project suggestions. This product is sent via email as a PDF file. As a teacher, it can be difficult to find the right curriculum to balance the needs of your students, meet the requirements set before you and still be interesting and engaging for both boys and girls. The experiences practiced in multisensory learning allow each student to participate in ways that help them understand and retain best. Boys and girls learn together and help each other with projects such as as making Native American accesories, growing a garden, having discussions about the story, historical information, geography, as well as positive character traits such as bravery, selflessness, etc. Make history come alive with highly educational and facinating field trips identified state by state. 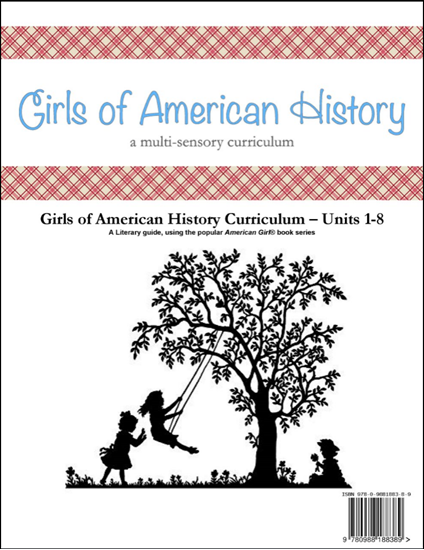 This set includes eight, six week unit studies using the American Girl® Kaya®, Felicity®, Josefina®, Kirsten®, Addy®, Samantha®, Kit® and Molly® series books. This curriculum is great for doing school in a large class setting, or a smaller co-op environment. Enjoy class parties with end of the unit celebrations that bring everything for the unit together at the end. Follow eight young girls on a journey through time. Watch as our country, government and culture change and how that affects life in the different time periods and how these girls discovered more about themselves and the world they live in. Craft and field trip ideas from the time periods are included in the unit to help enhance the study. Some examples of *crafts include; teepee craft, weaving, kite making, leather work, canoe craft, drawings and more. This series of books follows a young girl during the War of 1812. She struggles to hang on to hope as she learns lessons and makes brave decisions. Strong male characters include her father and a friend. This is a fantastic unit, filled with information about a war often forgotten and misunderstood. This is a great unit for character development and discussion. This unit will be enjoyed by both boys and girls, as the curriculum utilizes ship building, knot making and many other fun and educational activities. Field trips include, museums, sailing, fishing, and more. All units now include spelling and vocabulary, State/Country study, Character analysis worksheets, then and now comparison worksheet, news article prep, book summary, chapter summary with drawing, and digging deeper project suggestions. This product is sent via email as a PDF file. This is a unique unit that really encourages children to think about others, serve and help in their community and appreciate the arts. New Orleans is rich with a history unlike any other in the United States. Giving, serving and thinking about others and ways to help are things that help build long lasting positive character traits. The crafts in this unit lean more toward girls. This series of books follows two young girls through life in a part of the United States that truly has it's own culture. Their lives are different, yet their paths cross and a wonderful friendship blooms. 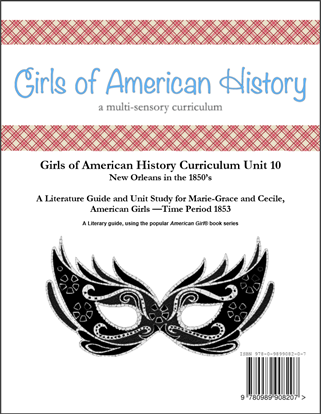 Additional areas of study include the Louisiana Purchase, Yellow Fever Epidemic, French language and more. Strong male characters include a grandfather, father and older brother. All units now include spelling and vocabulary, State/Country study, Character analysis worksheets, then and now comparison worksheet, news article prep, book summary, chapter summary with drawing, and digging deeper project suggestions. This product is sent via email as a PDF file.